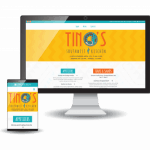 The team at Connect SWFL is proud to announce the launch for the recent website redesign for Realtor Tina DiCharia with The Simmons Team. The Simmons Team was in need of a more modern and responsive website that was user-friendly and offers the end user the opportunity to explore property listings and area information to help make informed decisions. The new website now features a custom-animated home page with an easy-to-use navigation menu linking to multiple pages with helpful content and resources. We are honored that The Simmons Team elected us to once again help them with their website and bring them up-to-date with a modern and sophisticated style.